The lore of the Warcraft universe is singularly focused on the divide between the Horde and the Alliance – or, if you’re older than a lot of its audience, orcs and humans. For many years, Blizzard has formed a sine-wave storyline that oscillates between the lows of factional, even nationalist warfare, and the highs of joining forces to face larger threats. No title, however, has delved deeper into the lore of the Warcraft universe than the MMORPG World of Warcraft, and no expansion of the same has attempted to push back down into war harder than its latest, Battle for Azeroth. That’s not to say there has never been an inkling of war. Even in vanilla (pre-expansion content) WoW the two factions – initially divided into the problematically savage and scary Horde, and the high-fantasy Alliance – have done endless battle, through player-versus-player combat and quests and overarching storylines that paint a picture of a conflict that only really halts if something threatens the worlds in which these two factions reside. As the expansions continued to release, the concept of this overarching threat – Legion’s titular, demonic Burning Legion, or Arthas, the Lich King, master of the enslaved undead – put stereotypes, suspicion and, frankly, lore-encouraged racism on the backburner in favor of dealing with Big Bads. What defined these enemies was their desire for destruction for destruction’s sake – rather than the cheesy, Red vs. Blue conflict that has ranged across multiple titles and over two decades. This was a step forward and, to many, Battle for Azeroth feels like a step, if not backwards, at least sideways. This time, there’s no force that visibly threatens both factions, in an era where both sides have repeatedly seen the benefits of sharing cities, battle-lines and, as of Legion, class-specific Order Halls. But how do you convince an audience that has moved past a small-stakes, petty war that it’s worth turning back the clock? If you’re Blizzard, it’s by taking your two faction leaders – Lady Sylvanas Windrunner, Banshee Queen and current Horde Warchief; Anduin, the pacifist son of his warlike father, and reluctant but passionate face of the Alliance – and mashing them together like action figures. 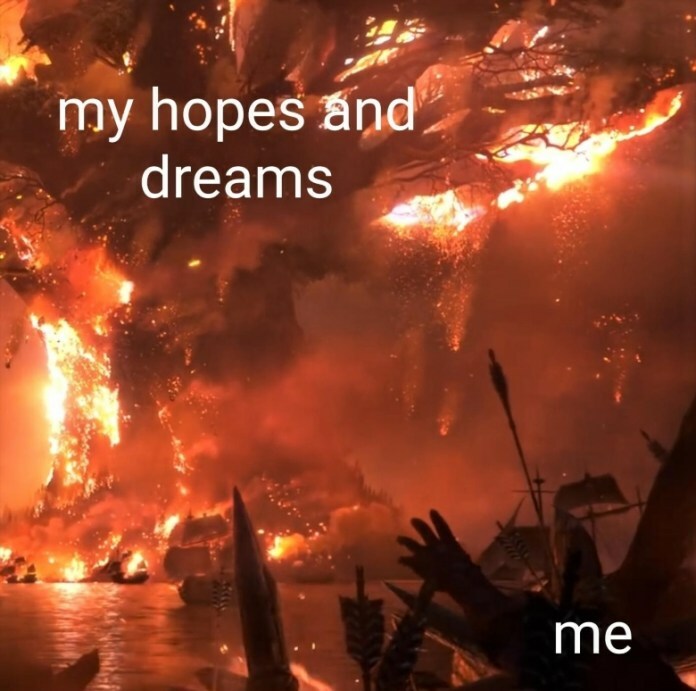 Sylvanas, for so long, a powerful, stoic character who wanted peace, and to avoid a fate for the undead similar to that of the enslaved Scourge under the Lich King, has suddenly decided that the best “first strike” to warn off the Alliance is to… burn down an irreplaceable ancient tree, and thus the home city of the Night Elves. 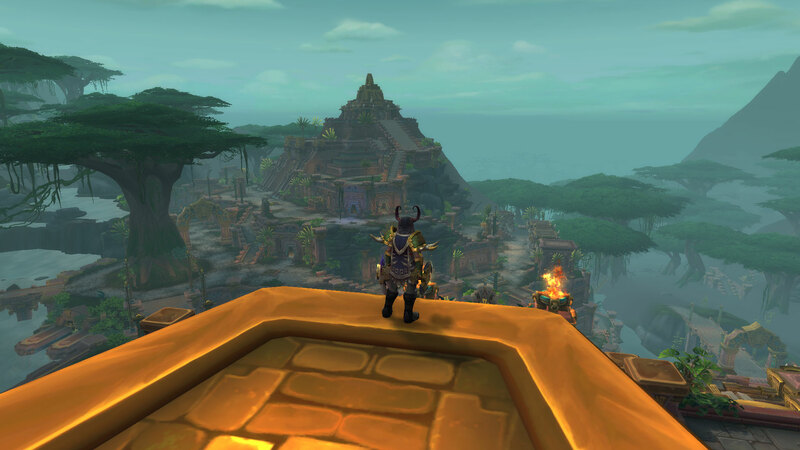 Watching that storyline play out was torturous, and you could see it not just in the conversations with your WoW-playing friends, but also in the WoW subreddit, on Twitter, and beyond. The community had watched a paragon of realist pacifism complete a heel-turn worthy of a Lich Queen – killing her own troops, raising them as skeletons, committing genocide – as Blizzard encouraged people to fight for the Horde. But the Horde (some of its characters, and especially its players) were reluctant. Who wants to play for the bad guys, when the story of the Horde has, for years, been that they were good characters, attempting to survive the warlike stereotypes painted onto them? 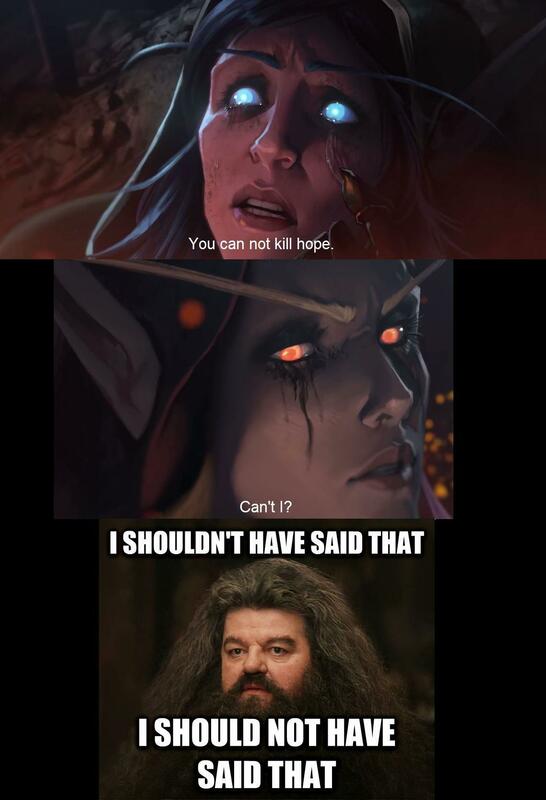 The memes were almost immediate, of course – Sylvanas, the Suddenly Super-Evil. But through it all, the jpegs, the joking responses in the comments – there was a noticeable undercurrent of unease on the Horde side. If we’re going to talk in memes, perhaps David Mitchell’s “are we the baddies?” is a better example. With some titles, that’s joining one group for the duration of a single playthrough. With WoW, that’s a commitment that has lasted for over a decade for some. I’ve been a Horde player myself since Christmas Eve, 2005. It’s a world you can spend thousands of hours in, and you start to treat the characters you see as important in ways you don’t always notice. “It’s surprising how much people treat computer-controlled characters as real, even unconsciously,” says Madigan. “People will do things out of habit like not invade NPCs’ personal space, talk to them out loud.” For casual conversation, it’s one thing – for generating the willingness to march into battle behind that NPC, it’s another, especially when you feel conflicted about that NPC’s motivations, or why you’re drawing up battle lines again in the first place. There are, however, a lot of very well-designed mechanics in Battle for Azeroth that help to accentuate the feeling of being on war footing. War Mode is the most notable example, allowing you to turn your entire PvE experience into one more akin to the PvP servers of old, in addition to granting you new, PvP-only abilities. Even when you’re not flagged for PvP combat, the feeling of seeing someone on the other side tends to raise your heart rate, as you wonder what will become more important to them – their current quest, or following the factional doctrine and cutting you down the moment your back is turned. That sense of feeling unsafe, wanting to kill before being killed, is crucial to the crafting of war that Blizzard aims for each expansion. But the start of each storyline that leads Azeroth and beyond back into war with itself matters. Not everyone wants to play an antihero, and when, as Blizzard does, you encourage people to wear clothing celebrating that faction – to yell “for the Horde” at BlizzCon – you risk having them question that commitment. Is it possible to still feel like the hero NPCs say you are, when your leader is striding down a path strewn with the bodies of the innocent – and the bodies of your allies? It’s not an unfamiliar feeling for Horde players, either. Garrosh Hellscream, several Warchiefs ago, ended up becoming a major antagonist. Troll and Goblin players found their own people living in the slums of the capital during his reign, and his transparent Orcish supremacist overtones and the sheer length of time it took for Blizzard’s storyline to move towards removing him from his position was a long time for players to carry the shame of their factional identity. Conversely, the Alliance were led by Varian – imperfect, impulsive, but objectively not a villain. Two villainous leaders in, and with the Pandaren from the Mists of Pandaria expansion already able to pick between both factions, perhaps the psychological commitment to one faction could end up being overridden. One of the key issues in WoW is that a lot of the storylines are resolved during cutscenes that play after the end boss fight of a raid. It’s content that not everyone is going to experience outside of YouTube, and that level of detachment can sometimes lessen the impact. It will be interesting to see how Blizzard intends to manage this growing feeling of unease for Horde players, and impatience to see if Sylvanas becomes an open villain. In a world where genocide is the obvious, ultimate Big Bad Thing to Do, there doesn’t seem much that the game’s writing team can do to allow Horde players to separate their factional identity from the atrocities being committed in their name, by their leader. This brings us to the war, to the call to battle that Blizzard has returned to after so many years. Once more into the breach, says the developer. Each city is faction-specific, and the three levelling zones you’ll play through are as well. This is intentional – it’s a throwback to the earlier eras of the game, in which the regions of the map your faction had no major footholds in were unfamiliar, scary, both due to their monsters and the opposing heroes that called them home. This in itself is a strong part of Battle for Azeroth. The geographical layout is designed to hold off your encounters with the other side until you’ve soaked up enough lore, and, frankly, enough faction propaganda, that toggling War Mode on and leaping into battle is a lot more alluring. Yet the leader of the Horde war effort, Nathanos Blightcaller the Angry Goth Uncle, is as menacing, cruel and ruthless as the Warchief he constantly pledges his allegiance to. It leaves you with an odd taste in your mouth, this expansion. Who is the Big Bad? The Old Gods? Sneaky politics? The genocidal faction leader? 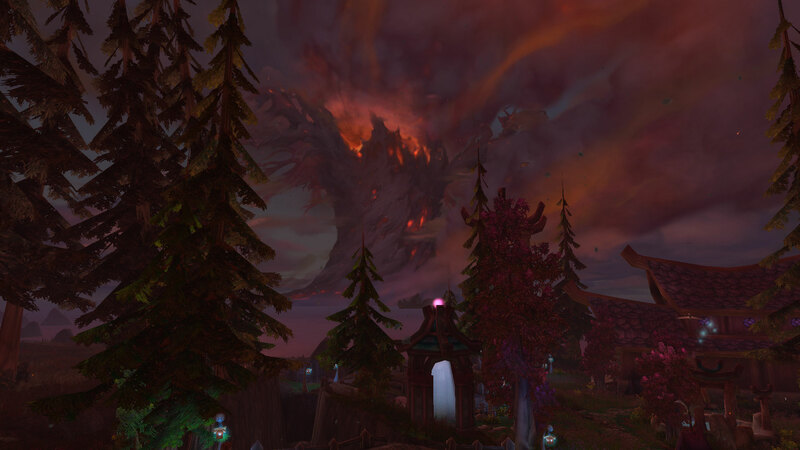 Blizzard argues it’s The Other Side, but due to the sheer depths of war criminality Sylvanas sinks to before the expansion even begins in full, is it possible to create a Two Sides narrative, when one side is so badly fractured by its internal politics? Blizzard knows it has some questions it needs to answer, and will either need to ease off on the Red vs. Blue gas pedal, abandoning the theme it has built this expansion on, or commit entirely, and continue to twist its Neutral Good NPCs to fit the task ahead, hoping the community will still be along for the ride. Tagged with Blizzard Entertainment, feature, World of Warcraft, World of Warcraft: Battle for Azeroth.